Nigerian Police Force (NPF) Constable Recruitment 2019 Application form is out register here to apply. This post is a guide for applicants who wish to apply for 2019 Nigerian Police Force (NPF) Constable Recruitment. 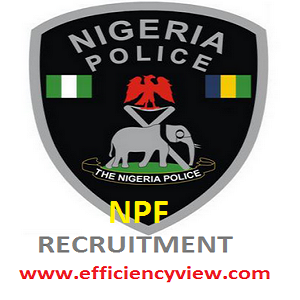 Download Nigerian Police Force (NPF) Constable Recruitment Application form here. This article is all about 2018/2019 Nigerian Police Force (NPF) Constable Recruitment, here I will list out all requirements involves and how to apply/register for 2019 Nigerian Police Force (NPF) Constable Recruitment. Must not have any one of the following abnormalities or deformities: Speech Impediment, Knock Knees, Bow Legs, Bent Knees, Flat Feet, Deformed Hands which cannot perform the full functions of the hand, Tattoos, Bodily Scar, Defective Eyesight or Squint Eyes, Amputation of any part of the body, Gross Malformation of teeth, Protruding Navel. Interested Candidates must download and fill the Guarantors’ Form, presenting verifiable references from any two (2) of the following: Traditional Rulers, Magistrate, Local Government Chairman, Heads of Educational Institutions attended, Career Civil Servant not below the rank of Grade Level 12, Police Officer not below the rank of CSP, or Military Officer not below the rank of Lieutenant Colonel. Possession of a valid National Drivers’ License is an added advantage. Note that after the recruitment process successfully shortlisted candidates will be listed.